What Did Gunsmiths Make During Colonial Times? During colonial America, gunsmiths made very few guns, working more as blacksmiths who made and repaired metal work. 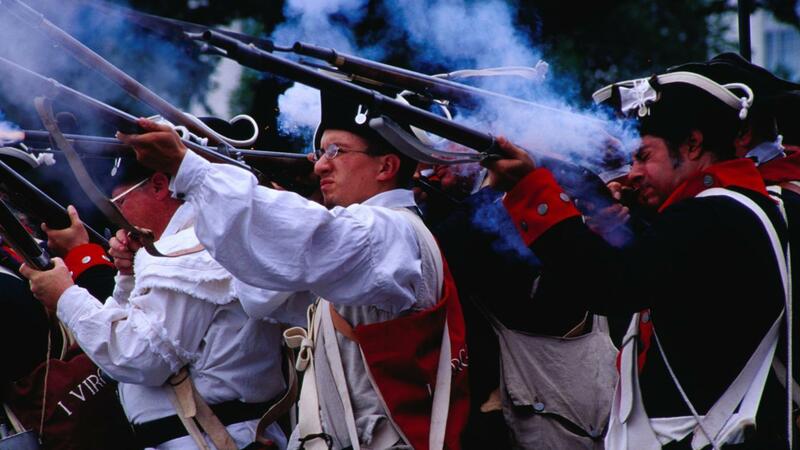 The guns that were made were muskets, fowling pieces, long rifles and swivel guns. A gunsmith rarely labored on guns during colonial times. Instead, he focused on other metal work, assembling the occasional firearm from parts shipped over from Europe. More often than not, he merely repaired guns. In fact, it was difficult to find a gunsmith for gun repairs in colonial America because of the low demand for services and the low rate of gun ownership. A gun made completely from scratch required several gunsmiths and specialized tools, which didn't even exist in colonial America until the Revolutionary War forced the issue. However, colonial gunmakers in America created the long rifle, which was the only gun manufactured in America in the 1700s. The long rifle was critical to the colonists because it allowed hunters a longer range and reduced the need for ammunition. It was during this time that the flintlock system for guns was invented and incorporated into the military muskets used during the Revolutionary War. Civilians used fowling pieces, which were used exclusively to hunt birds and small animals. What Kinds of Repairs Do Gunsmiths Offer? What Did Colonial People Wear?